Our nation’s unprecedented opioid epidemic continues to strain healthcare organizations across the care continuum. 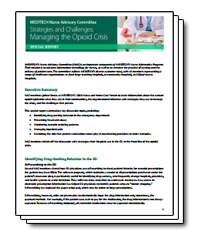 In response, MEDITECH’s Nurse Advisory Committee (NAC) published a special report, Strategies and Challenges: Managing the Opioid Crisis. Examining the role patient satisfaction scores play in incentivizing providers to order narcotics. This special report from MEDITECH’s impressive nursing community provides strategies and initiatives that can be deployed to fight the epidemic, and includes a feedback form for readers to share how they are managing the crisis.